Janice was commissioned by the Architect and committee of this award winning church to design and create a new pulpit fall. 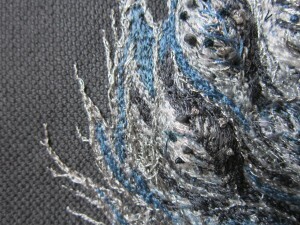 Janice has used a combination of machine stitching and hand embroidery techniques. A domestic sewing machine has been used to build up interwoven layers of stitch forming the main body of the burning bush. The background fabric is a linen / cotton weave which was hand dyed by Janice to compliment the interior of the church. The threads which have been selected in silver and blue tones are also conducive with the colour palette used in the sanctuary of the church. The undulating surface of the bush has been created with the application of individually stitched leaves worked onto ‘dissolvable fabric’. The leaves were immersed in warm water until the fabric disappeared and then hand manipulated whilst damp to enhance their convex form. 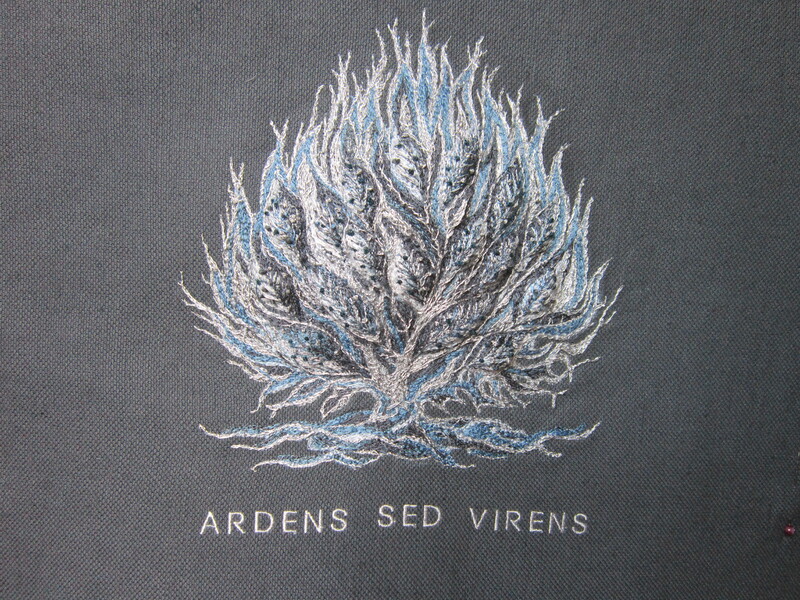 They were then padded and stitched into the bush. 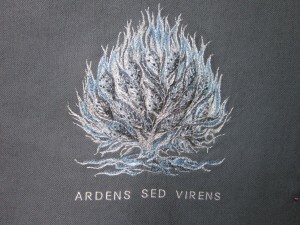 Small French knots which represent buds embellish the leaves, giving the bush life (Ardens Sed Virens – Burning but not consumed) while hand stitching with silver thread provides definition to the flames, creating a rich and decorative finish. The final form exemplifies the close collaboration with the Architect and is a modern interpretation of the Burning Bush which compliments the interior of the church.